Let’s travel back in time to 1865 where we join Mr Green, who is fitted with his trademark bowler hat, as he is on a mission with his gun and silver bullets to avenge the brutal killing of his wife at the hands of a ferocious werewolf. Exclusive to Mr Green, which has rapidly become one of the leading UK online casinos over the past few years, Mr Green Moonlight has a gritty industrial feel set on the cobbled streets of St James Street in London in a setting similar to that of fellow Victorian-era Net Ent slot Steam Tower - and with Linked Wilds and Free Spins on offer this is an exclusive you simply can’t miss out on. Mr Green Moonlight consists of the typical Net Entertainment structure of 5 reels and 20 paylines. The coin values on offer range from £0.01 up to £0.50 and with ten betting levels at your disposal this provides you with the opportunity of playing every payline from only £0.20 per spin up to a maximum of £100 per spin – and with it boasting a maximum win of 175,000 coins you get to reap the rewards of Mr Green’s glorious revenge! While most real money online slot machines contain one Wild symbol, Mr Green Moonlight breaks the mould as there are two – the Moonlight Wild and the Blood Moon Wild, but more on those in the Linked Wilds section below. The Scatter symbol, which is required to trigger the free spins feature, is a Silver Bullet with an inscribed design on it and an electric blue eclipse in the background. Accompanying these symbols are Mr Green himself with his revolver pressed against his bowler hat, the fearsome werewolf, Mr Greens wife, his weapon with silver bullets and gun holder, plus standard Ace to 9 playing card symbols that you find in video poker machines and other casino games. As alluded to above, there are two different kind of Wilds in the Mr Green Moonlight slot machine – a Moonlight Wild and the Blood Moon Wild - with both having the power to substitute for all other symbols aside from the Scatter as well as additional perks to boost your chances of landing a winning combination. These Linked Wilds see two or more nearby symbols transformed into Wilds which rarely fails to deliver additional wins. Moonlight Wild is represented by a blue moon and can only appear on reels 2, 3 or 4 whereas the Blood Moon Wild guarantees a Wild on each of the free spins you are granted in the free spins mode. Locked and loaded, it’s time to fire those silver bullets and claim victory in the form of huge wins. The free spins feature begins as soon as you land three or more of the Scatter symbols (Silver Bullets) anywhere on the reels. This feat will see you instantly rewarded with 10 free spins, but the best is yet to come. During your free spins you have the opportunity to add to your spin count simply by landing Scatter symbols again. Two Scatters reward you with five more free spins while three Scatters provide you with ten more free spins, however these additional spins are not subject to the multiplier bonus that is on offer. The multiplier bonus is seen on reel 5 and increases the win multiplier by one each time until the maximum of 5x has been reached which results in it being removed from the reel while these rest of your free spins play out. This is a stunning slot machine from Net Entertainment which can be played exclusively at www.MrGreen.com, and is their second exclusive title following on from the success of the Marvellous Mr Green slot machine. 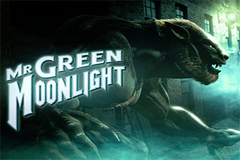 On top of the impressive graphics set on the streets of London, Mr Green Moonlight includes two impressive bonus features - Linked Wilds and Free Spins which both offer vast winning opportunities. I also particularly like how additional free spins are added to your spin counter when two or more Scatters fall on the reels – this happens very frequently so you will be pleasantly surprised at the number of free spins you will actually enjoy rather than the initial sum of ten.